The question of the relationship between religion and rationality is highly relevant in today’s world, as demonstrated by the debates that rage to this day concerning religious conflicts and their underpinnings in rationality. The conference proceedings in this volume examine this complex relationship by looking at a number of different sacred texts. This medium shows how religion can be classified in terms of rational coherencies. 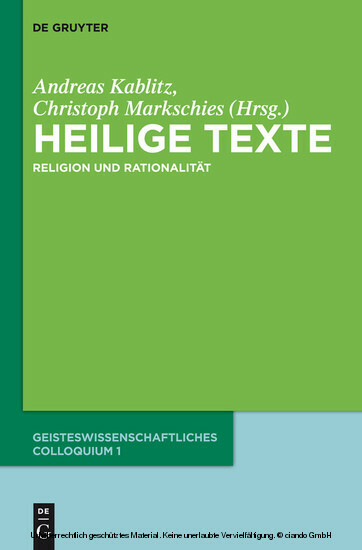 However, the very fact that religion is manifested in texts creates a paradox that places religion in an ongoing dialogue with rationality – and this in turn is a precondition for religion’s continued existence through time. Andreas Kablitz, Universität zu Köln; Christoph Markschies, Humboldt-Universität zu Berlin.